Anthonia Nwaorie. Photo courtesy of the Institute for Justice. HOUSTON (CN) – A Texas nurse traveling to Nigeria claims in a class action that U.S. customs agents wrongly seized over $41,000 in cash from her that was meant to start a clinic for women and children in the West African nation, and have refused to return it unless she signs a waiver. Anthonia Nwaorie sued U.S. Customs and Border Protection and Commissioner Kevin McAleenan, in Houston federal court on Thursday, alleging violations of the Civil Asset Forfeiture Reform Act, or CAFRA, and due process violations under the Fifth Amendment. 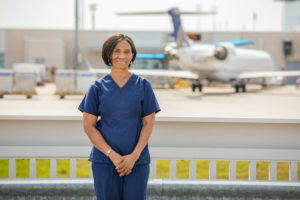 Additionally, Nwaorie says that even if she had known about the reporting requirement, complying with it would have been “quite onerous.” CBP’s office at George Bush Intercontinental Airport is not located on airport property and is almost 7 miles from the terminal from which her flight departed, according to the complaint. Nwaorie had planned to use over $30,000 of the seized money to start a medical clinic for women and children in Nigeria, she says. The rest of the money was to be given to family in Nigeria to pay for medical costs, retirement expenses and home repairs. The CBP sent Nwaorie a CAFRA seizure notice in November 2017, and she in turn requested that CBP refer her case to the U.S. attorney’s office for a judicial forfeiture proceeding rather than an administrative proceeding. “CBP is holding people’s money hostage,” he said. A CBP spokesperson said its policy is not to comment on pending litigation. Nwaorie claims she has already been targeted for intrusive screening following the original seizure incident with the CBP. She is represented by Alban and Anya Bidwell, both with the Institute for Justice.